If you self-publish online with Amazon.com and you don’t live in the USA, the chances are you’ll need to prove that you are a taxpayer in your country. If you don’t within 3 months of your book going up / selling (Amazon pays royalties at the end of the month after 2 full months’ duration), they’ll likely withhold 30% so they pay the tax on your behalf (or rather, you do, you just don’t get given it). http://www.theindieview.com/2010/09/03/foreign-authors-wishing-to-publish-on-amazon-read-this-itll-save-you-a-lot-of-time explains that you need a W8-BEN form (see right) and a TIN / ITIN (Tax Identification Number). 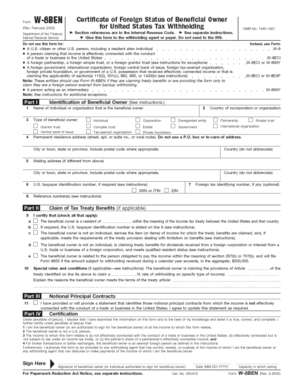 To get an ITIN you need a Form W-7. Fill in form W-7 (instructions are here). When you have received your ITIN number fill out form W8-BEN. Mail the forms to Amazon. You’re done – you just saved 30% of your income. A list of Acceptance Agents (the grand sum of five in the UK) and Authorized offices that can accept documents for ITIN are the IRS website. As far as I am aware, that’s all relevant if you have a day job and are making extra money from your writing. If you are a sole trader (a full-time writer with no other main job) then you need an SS-4 (and the instructions for filling it out are here). Before you start filling out the forms, I’d suggest printing off two copies and filling in your copy first as you’re bound to make some mistakes! Reason for submitting: likely to be (a) Nonresident alien required to get ITIN to claim tax treaty benefit. 1b: Name at birth (if different). 3: Full postal address (if different to above). 4: Date of birth (month-day-year) e.g. 12-01-1979 (I wish! ), Country of birth (e.g. England). 5: Check (I crossed) Male or Female boxes. 6f: TIN or EIN reference no. then sign your life away! 2. Country (in full, not UK). 4. House number and street name (first line). Town, county, postcode (second line) then Country (in full, not UK). 5. Mailing address (if different from above). 9. I certify that… and then check the boxes that apply. Only box (a) applied to me: The beneficial owner is a resident of (England) within the meaning of the income tax treaty between the United States and that country. 10. Special rates and conditions (didn’t apply to me as not a researcher or student). 11. Notional Principal Contracts (didn’t apply). 12. Sign your life away. 2. Trade name of business (I put my pen name). 3. Executor, administrator, trustee (I left this blank). 4a. House number, street name. 5a. House number, street name (if different to above). 5b. Town name, postcode (if different to above). 6. County and state (I put my county and country). 8a. Is this application for a limited liability company? (I crossed the ‘no’ box). 9a. Type of entity (I crossed the ‘Sole proprietor’ box. 10. Reason for applying (the first box ‘Started new business’ was the closest and I put ‘Freelance writer selling in the US). 11. Date business started (I put the day after I left my day job). 12. Closing month of accounting year (I thought the UK was March but the notes suggest it would be calendar year so I’ve put December and am hoping my tax office will steer me). 15. First date wages or annuities yet (left blank as I haven’t had any yet!). 16. Check one box that best describes the principal activity of your business (shouldn’t that be principle?). I went for ‘other’ and put ‘writing / literature’. 17. Enter principal line of merchandise sold… (I put ‘fiction writing: novels, short stories, eBooks etc’). 18. Has the applicant entity shown on line 1 ever applied for and received an EIN? (I checked the ‘no’ box). Then sign your life away. Clear as the proverbial mud, isn’t it. If you’re based outside the U.S. and have been through this process (I’m going through it now but not out the other side yet – I’ll update this if I found anything to be wrong), I’d love you to write a guest blog post on this topic. I’ll then post it a.s.a.p to help those out there who are bound to be struggling through the process. Also interesting reading: http://catherineryanhoward.com/2012/02/24/non-us-self-publisher-tax-issues-dont-need-to-be-taxing. Thanks to Alison Thompson for directing me to that link. Smashwords’ section on this matter: http://www.smashwords.com/about/supportfaq#Royalties. Update October 2013: I’ve finally got round to completing the online information (logging into my KDP account and clicking the link that asked for the missing tax information. I was presented with a W-8BEN which I completed. It came up with a message… Your information has been received and is awaiting validation. We will contact you if we require additional information …at the top of the form (so I took screen prints). Back in February this year, I’d filled in a W-8BEN and sent it to my tax office (with a W-7 and an SS-4), and they’d sent me back a letter to send off if necessary confirming I’m a UK tax payer. I put my HMRC ref (five digits, space, five digits) on the electronic W-8BEN form so I’ll see what happens. Update December 2014: Still on the matter of tax, one of my students used to work for the tax office and mentioned ‘Literary averaging’ which means that if you spend a year writing a book then it does really well over the following year, you can average out your earnings (paying less tax) over the two years. More details on https://www.gov.uk/government/uploads/system/uploads/attachment_data/file/323619/hs234.pdf. Is the tax file number given to one in Australia good enough proof perhaps? I don’t know, unfortunately, Jo, but I suspect you’ll still need to fill in a form or three. You’re probably best contacting your tax office. They should know. Good grief! I’m just about to put an ebook up on Amazon. It’s a 45,000 novella that used to be a serial in a magazine in a previous life. I don’t expect to earn millions, or thousands and will be lucky with a hundred. But presumably I still have to do all this or lose 30% of what I do make. Any idea what the position is if you’re full-time self employed in this country and the extra income from writing is just that – extra. Thanks for this, anyhow! I’d say your best bet is to complete all the forms (not that hard when you come to it) and send them off to our tax office (I dealt with HMRC, PAYE & Self-Assessment, PO Box 1970, Liverpool, L75 1WX) and see what they say. I did that and they sent me back a letter (I assume to send to Amazon confirming I’m a resident of the UK “within the meaning of Article 4 of the Double Taxation Convention between the UK and the US throughout the year 6 April 2012 to 5 April 2013). Okay, Morgen – Let me get this straight… because I have ‘quit my day job’ and I’m no longer teaching, I don’t need a to fill in a W7 or W8-BEN? I just skip ahead to the SS-4? I’m looking at starting this next week….eek! Technically, theinventor1. I’ve still completed all the forms and sent them off to HMRC (PAYE & Self-Assessment, PO Box 1970, Liverpool, L75 1WX). They sent me back a letter (I assume to send to Amazon) confirming I’m a resident of the UK “within the meaning of Article 4 of the Double Taxation Convention between the UK and the US throughout the year 6 April 2012 to 5 April 2013”. I would say it’s better to do as much as you can to avoid any queries. You’re very welcome, Melissa. Sorry I’m a bit vague (as was the tax office!) but still going through the process myself. I will update the page as and when I need to. If you’d like to take part in anything on the blog, by the way, the guidelines are listed on https://morgenbailey.wordpress.com/submission-information/opportunities-on-this-blog. It certainly is. Thank you, Diane.